It’s only been a week but Penton Group President Fred Linder was gracious in answering five questions on the future of the World Tea Expo and its ancillary business ventures. Linder will oversee World Tea Expo as part of Penton Exhibition Services which supports more than 100 events across five sectors. Linder also runs the company’s New Hope Network. Penton is a large business-to-business publishing company based in New York. It’s flagship tradeshows include Natural Products Expo (West and East) and the Multi-Unit Food Service Operators Conference. The company also publishes Nation’s Restaurant News, Natural Foods Merchandiser and Supermarket News. In announcing the acquisition Linder retained the core team that includes Event Manager Samantha Hammer Mitchell, Education Program Manager Monique Hatchett, Customer Service Manager Edie Gillette and Tea Academy Director of Online Education Donna Fellman. Hammer Mitchell is a former Penton event manager. Click here for details of the sale. Tea Biz: Mr. Linder please share your vision for World Tea Expo and its ancillary educational program, competitions, industry awards and newsletter. Linder: It’s a bit too soon for me to articulate a strategy for the individual part of the business. We bought World Tea Media because we like the Tea category and we feel that we can help the industry grow as we have proven in other Food sectors, most notably in the Natural Products industry. I also think that World Tea Expo is a better fit inside of Penton. We will work with the leadership within the Tea group to evaluate what is working and what may need improvement. Tea Biz: The tea community wryly observes “there are beverages, and there is tea. They are not the same thing.” During recent years the Expo floor was opened to many classes of beverages from artichoke, coconut and vitamin water to liquid herbal supplements. Will that continue? Linder: Again, that will be determined in conjunction with the Tea leadership team. From a very general point of view, I am not a fan of diluting, but I also don’t think it’s an all or nothing approach. We have an excellent track record in other industries of making sure that attendees and exhibitors have an authentic experience that is aligned with their and the industry’s expectations, while still allowing for growth and innovation. Authenticity is key. Tea Biz: The Expo is noted for an exceptional educational program seen by industry veterans as catering mainly to those who want to get into the business. What will Penton do to entice the best and brightest veteran retailers, wholesalers and exporters to attend and share their insights and expertise both from the podium and casually on the exhibition floor? Vendors realized more sales and bigger sales in the past. Attracting premium buyers to the event is the tide that lifts all boats. How will Penton draw quality buyers to the event? Linder: We have an excellent database across Penton and deep experience with education, most notably, for innovators and entrepreneurs. In addition, our marketing capabilities are second to none. By combining these disciplines with the expertise within the Tea team we will create a winning formula for growth in both quality and quantity. Ultimately, the success of any show is about the right attendees having the right conversations with the right exhibitors through a mix of networking and a vibrant education program. Tea Biz: Will Penton through its North American Tea Competition take a leadership role in defining and advancing standards for specialty tea? Linder: At this point I don’t know enough to answer this question. We did have standards programs in other businesses so we are experienced in the mechanics of what that could look like, but what Penton’s role in that might be is an unknown to me at this time. I will say that although we have owned the business for only a week, I am really impressed by the staff and their enthusiasm and passion for the business and the industry. I will rely on their expertise and guidance a lot on where and how Penton will best fit into aid and abet in the growth of the category. There’s much to learn, but through our broad experience with education, content trade shows, combined with an understanding of the food and food retailing sectors it will be a very exciting time for all of us. I am very bullish on the future. Fredrik M. Linder is an expert in natural products and the health and wellness arena and has a passion for the industry and its mission. 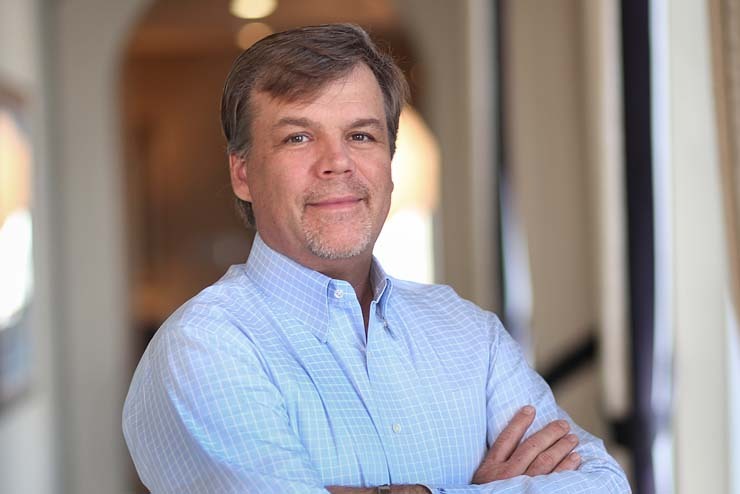 Fred’s industry relationships are deep, which allows him to understand where all of the companies and products fit together, how they are trending and gives him direct access to the top leaders in the industry who look to him as a sounding board. He was instrumental in the development of Penton’s data and insight products for the natural products industry. Fred also runs Penton Event Services supporting all Penton best in class events. In addition, Fred is responsible for Club Industry, LDI and the newly acquired World Tea Media assets. Fred serves on several boards including SISO and the Company Council of IADSA (International Alliance for Dietary Supplement Associations). In the past he served on the boards of the Tuberous Sclerosis Alliance, The Coalition to Preserve DSHEA, Bastyr University, and The Dietary Supplement Education Alliance. In addition to New Hope and the Penton Exhibitions Services team, Fred oversees Club Industry and Live Design. Prior, he was employed with Meredith Corporation, Capital Cities/ABC and Universal Media. World Tea Expo was acquired last week by Penton, a large New York based business-to-business publishing company with a portfolio of trade events serving the natural food industry. The transition of the tradeshow, the North American Tea Championship, the World Tea Academy and World Tea News from Ohio-based F+W Media, A Content + eCommerce Company is underway. Terms were not disclosed. Penton announced that Group President Fred Linder will oversee World Tea Expo as part of Penton Exhibition Services which supports more than 100 Penton events across five sectors. Linder also runs the company’s New Hope Network. “An essential element of our strategy is to focus on high-growth sectors and extend leadership positions. World Tea Media is at the forefront of the U.S. tea industry and is poised to double its size over the next five years,” said Linder. “This portfolio of events and digital products perfectly complements our assets. We have the ability to nurture and grow entrepreneurial businesses through our understanding of consumer behavior, product innovation, future trends and exceptional relationships,” he said. “The show will remain a standalone with World Tea Media operating as a separate entity,” said Kate Spellman, Chief Marketing Officer at Penton. Key staff members were retained including Event Manager Samantha Hammer Mitchell, Education Program Manager Monique Hatchett, Customer Service Manager Edie Gillette and Tea Academy Director of Online Education Donna Fellman. Hammer Mitchell is a former Penton event manager. “We’re excited to work with the team at World Tea Media to further extend their value as an information resource for the global tea industry, with an emphasis on the growing specialty, premium tea and healthy beverage segments,” said Linder. Penton dominates the publishing sector for marketers of natural consumer packaged goods brands, retailers, suppliers, and investors. The Natural Products Expo East and West tradeshows have grown by 20%, according to the release. There were 2,700 exhibiting companies and 634 first-time exhibitors in 2015. Natural Products West annually draws more than 75,000 attendees to Anaheim. Expo West and the smaller Natural Products East currently host a big selection of tea vendors, many of whom previously exhibited at World Tea Expo. The list of more than 200 exhibiting tea companies includes AOI, Argo Tea, Bigelow, Choice Organic, Davidson’s Organic, Harney & Sons, Hain Celestial, Inko’s Tea, Mighty Leaf, Stash Tea Co., Steaz, Teapigs, Traditional Medicinals, Third Street Chai, Twinings, and Zhena’s Gypsy Tea. Click here for a list of tea exhibitors at the March 2016 Expo West. 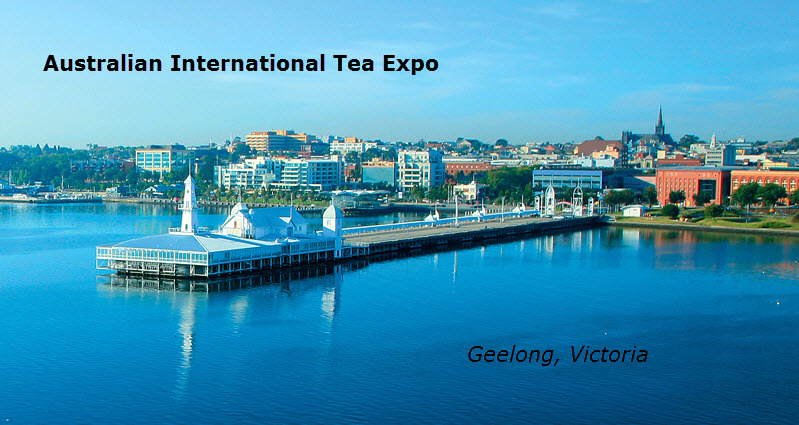 Click here to see a list of tea exhibitors scheduled to attend the June 2016 World Tea Expo. The Penton press release explains the company “has created a formula to nurture and grow innovative entrepreneurial businesses in emerging markets into large retailers with mass distribution. Penton also has the ability to tap into large food manufacturers through its leading food brands — Multi-Unit Food Service Operators Conference (MUFSO), Nation’s Restaurant News (NRN) and Supermarket News. Penton will combine its learning’s from both the natural products and food marketplaces to accelerate the growth of tea and beverage companies, according to the release. Penton is a private company owned by MidOcean Partners and Wasserstein & Co., LP. The company “empowers nearly 20 million business decision makers in markets that drive more than 12 trillion dollars in purchases each year,” according to the release. F+W is experiencing a reorganization following the departure of Chairman and CEO David Nussbaum. Founded as a traditional publisher, since 2008 F+W has grown its ecommerce business from one store and $6 million in revenue to 31 individual ecommerce stores with expected revenue in excess of $65 million for 2015, according to an interview with Nussbaum in Publishing Executive. World Tea Expo launched a dozen years ago in Las Vegas. It was operated by George and Kim Frost Jage for a decade before they sold to F+W in January 2012. The couple continued to manage the event through 2013. Two years ago the show moved to Long Beach, Calif., where the latest edition was produced last May. World Tea on the Road scheduled for Oct. 10-11 in Boston was canceled. The next roadshow is a Chicago event scheduled for Nov. 7-8. Click here to register. Ten years ago the show was among the fastest growing in the U.S. Exhibitors numbered more than 300 and attendance topped 5,000 but has since declined. Expo retained a reputation for superior retail training and its educational program however and has spawned several related services including the widely distributed weekly World Tea News, tea championships and tea academy. The next Expo will return to Las Vegas June 15-17, 2016 at the Las Vegas Convention Center. Pre-conference programs begin June 13-14. There are currently 150 exhibitors listed for the show. World Tea Expo focuses on the premium tea segment including Chinese, Taiwan, Indian and Korean exhibitors as well as many U.S. based tea vendors. Firms purchasing significant space on the show floor include International Tea Importers (ITI), Teas Etc., QTrade Teas & Herbs and similar mid-sized tea importers and blenders. Attendees include buyers with purchasing influence representing grocery chains, mass merchandisers, independent retailers, tea shops and coffee houses from the U.S. and 46 countries. An online tea certification and education program for professionals launched in 2014. It is managed by Donna Fellman. The program has graduated 233 students from 29 countries. The majority who enroll are from the U.S. and Canada. Courses cost $325 to $400. “Test only” certifications are $125. There is a core curriculum presenting courses on essentials and advanced courses. Some of the more popular are the biochemistry of tea, presentation and blending, and understanding tea culture. The next competition is the 2015 Packaged Single Service Class which for the first time will accept K-Cups. The entry deadline is Oct. 30. Click here for a list of the Spring Harvest Class winners July 30-31. Launched in 2005, the newsletter was distributed to 2,000 readers every two weeks. Founder George Jage described a mission “to deliver clear, concise updates on trends, breaking news and product releases. Buyers have limited time and they need brief but focused information to best understand this increasingly popular and powerful beverage category,” he said. The newsletter was re-launched in 2011 with delivery to 14,000 readers. The next weekly issue is scheduled for delivery Tuesday. Sources: World Tea Media, F+W, Penton. Location data is critical to retail success and essential to expansion planning. Market research firm AggData offers a revealing tool that TIME Labs used to rank the richest retail locations in the U.S.
You can experiment with it free online. The interactive form compiles the U.S. median income of brands based on updated 2013 Census data. TIME ranked 2,996 chains by comparing the median income of the counties where stores are located. TIME used this information to rank the richest department stores, grocery stores, and restaurants by location. You can use it to perform some useful local reconnaissance on tea, coffee and cafe chains. I started with 390-store Teavana and DAVIDsTEA. The table only ranks U.S. locations which include 311 Teavana stores and 24 DAVIDsTEA locations along with 30 Argo Tea locations. In 2013 the median household (inflation adjusted) income for the entire country was $51,939 according to the U.S. Census Bureau. DAVIDsTEA has located its shops in very high income counties (Chicago, Boston, New York, San Francisco) with a mean income of $73,226. These stores are located in counties ranking in the top 30% of U.S. incomes. Teavana is more broadly dispersed with mall stores in 46 states. Teavana Tea Bars are located in places like Manhattan and Beverly Hills. 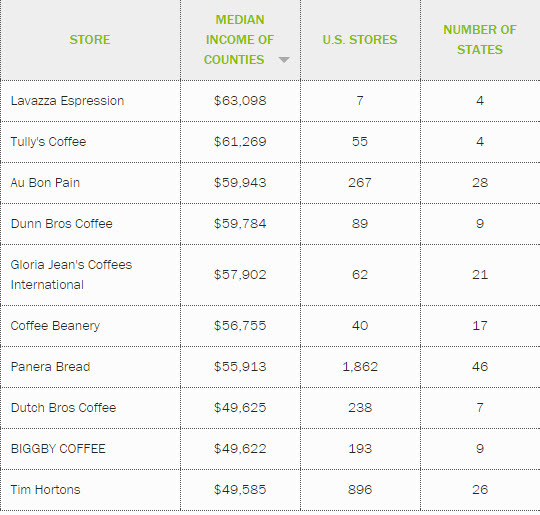 The median county income for Teavana locations is $62,304. Teavana locations are situated within counties with households in the top 41% of U.S. incomes. Argo follows with stores in five states and a median county income of $56,263. These locations rank within the top 44% of U.S. household incomes. By comparison Starbucks has 12,231 locations in all 50 states (and two territories) with a median $52,739. The company also operates 27 Seattle’s Best Cafes in 16 states where the county median is $56,261. This number does not include the many thousands of non-branded locations where Seattle’s Best is sold. To investigate competitors within your own market click this image and scroll to the bottom of the TIME page. Then use the search box to compare chains including Dunn Bros. Coffee, Coffee Beanery, Dutch Bros. Coffee, Tim Hortons, Gloria Jean’s Coffees, Tully’s Coffee, Panera Bread, Au Bon Pain etc. Peet’s Coffee & Tea was not listed. Household median income, from the 2013 American Community Survey, is averaged across all counties for every retail location available from AggData to find the “median shopper income.” Estimates for shopper’s income would likely show greater disparity if calculated by geographies smaller than counties, which include a broader spectrum of household incomes. Only brands with stores in 20 or more U.S. states are considered national chains and used in the lists above. Though all brands are available in the search feature regardless of the number of states they operate in. China is making its biggest splash in tea in modern times this summer at Expo Milano 2015 the world’s largest food and beverage tradeshow. “Never before has Italy hosted so many tea experts from China all together with so many companies representing the excellence of Chinese tea,” writes Marco Bertona, chairman of the Tea Association of Italy. 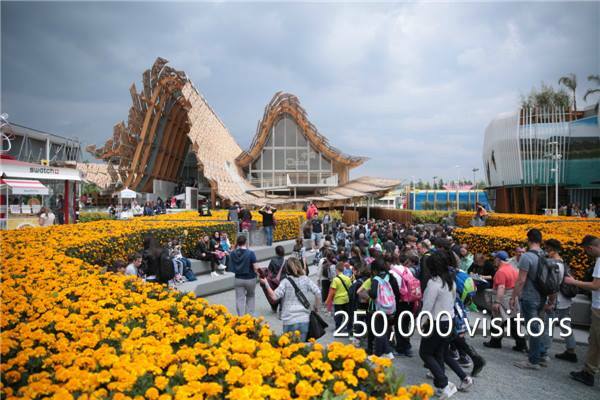 The China Pavilion in Milan is shaped like fields of wheat rippling in the wind to reflect the theme, “Land of Hope, Food for Life.” It has been visited by almost 250,000 tourists since it opened in May. “Chinese Tea Culture Week” which ended Sunday brought to light a political mandate to make China the world’s greatest tea exporter. In 2013 Xi Jinping, China’s new president, proposed The Belt and Road Initiative, a modernization of the Silk Road Economic Belt and the 21st Century Maritime Silk Road. The goal is reviving ancient trade routes between Asia and Europe. The proposed trade and infrastructure network passes through more than 60 countries and regions, with a population of 4.4 billion. Nations along the route produce more than 80% of the world’s supply of tea. Unlike past initiatives which emphasized quantity over quality, this time China is determined to dominate the global market for premium tea. In 2014 more than 80% of China’s tea exports were low grade green tea destined for Africa, Europe and Russia. Right now there is a surplus of commodity tea and a scarcity of premium tea making this a good time to export fine tea. During the past decade the green tea that China exported sold for between $1 and $2 per kilo. In December 2014 the world average price for tea sold at auction was $2.56/kg down from $2.72/kg the previous year. The average dropped an additional 30-cents to $2.42/kg by the end March 2015, according to statistics compiled by the Central Bank of Sri Lanka. China Daily reports that the average price of Chinese tea increased to $4 per kilo during the past few years. Last year Chinese tea exports $4.19 per kilo. This is a big improvement but is still not enough to be profitable, according to Chinese traders. China’s tea market was valued at $56 billion (RMB 350 billion) in 2014. Exports comprise only $1.27 billion of market value, but were up 2.1% compared to 2013. Export volume declined 7.5% during that same period, an indication that China is shipping greater quantities of higher-value tea. Specialty teas, in contrast, sell for $150 a kilo with some bringing $350 to $400 per kilo. In 2013 China was the world’s second-biggest tea exporter at 322,600 metric tons behind Kenya’s 494,400 tons. That year Sri Lanka exported 319,600 metric tons. In 2014 Sri Lanka stepped up exports, setting a record at 327,800 metric tons and China fell to third. China is without doubt capable of meeting global demand for premium tea. It is the only large tea producing country capable of mass producing all six kinds of tea. China already produces 40% of the world’s tea and is developing thousands of additional acres per year. Tea is grown there on 6.7 million acres (2.7 million hectares) and it is exported to 120 countries. China’s tea is marketed by more than 200,000 companies representing the work of 30 million growers. China retains its customary lead in the production of green tea, exporting 79% of the global total and accounting for 80% of value. In most instances exported Chinese tea is blended with herbs and fruits. In the US sales of green iced tea have increased significantly as national restaurant chains promote green tea’s health benefits. At least 10% of the nation’s restaurants now serve green tea alongside traditional black. Despite its massive production capability “China is not strong enough in exports of tea leaves, tea extracts and deep-processing elements which are fundamentals of the tea industry,” according to Wu Zhibin, vice chairman of the Chinese Tea Culture International Exchange Association told Taiwan-based Want China Times. Deep-processing is the Chinese term for what in the west is known as value-added tea. Tea Culture Week at the Chinese Pavilion is an opportunity “to support top brands of Chinese tea industry in their path towards growth and worldwide development,” said Zhibin. He praised the top Chinese exports brands which were recognized at as special award ceremony in Milan. “With rising production costs in China and competition that is likely to intensify, Chinese tea producers have to find new strategies to boost Chinese brands and their sales on the global stage,” says Ji Xiaoming, president of Jingwei Fu Tea Co and chairman of the Shaanxi Tea Association. “Only if the Chinese tea industry is strong, the Chinese tea culture can be innovative and can be promoted all around the world,” Wu told Xinhua News Service. China Daily reports that “One Belt, One Road” is a rare opportunity to turn Chinese tea consumption into a global phenomenon. “That is the dream of the country’s tea companies – which are still largely unknown to the world. They are ready to grab a piece of the action in an anticipated market boom,” according to the newspaper. “The Belt and Road Initiative is not just a rejuvenation of the ancient silk road, but also a comeback of the ancient tea road,” said Jiao Jialiang, chairman of LongRun Group, a Chinese conglomerate specializing in food and health products. “It’s believed the practice of tea culture can take the spirit and wisdom of humans to a higher level, and its study covers a wide field with rich content,” the paper reported. Tea culture will lead the way boosting the Belt and Road Initiative, said Jiao, “as tea culture spreads around the world, the whole industry will take off,” he said. An informal assessment of China’s export market for tea. China has the land, tea varieties, tea quality, government incentives and motivation to excel in tea exports. The growth of tea retail outlets (T2, Teavana, DavidsTea, TenRen) is a very promising development. 1400 years ago China was the top tea exporter and even after India replaced it as a quantity supplier China always offered more varieties and higher quality orthodox, remaining dominate for centuries. India is the only producing country with similar capacity and it cannot effectively compete. Kenya will remain the dominate commodity supplier of black tea, but remains an insignificant supplier of green. Anything the Chinese can do with green they can industrialized and scale for black, but doing so is not profitable with Sri Lanka, India and Kenya in the picture. China is expert at orthodox green and while it will step up its black tea production for Asian consumption, European and US export, it will make its greatest gains in premium green/white, pu-erh and oolongs. China’s RTD tea market is valued at about $29 billion. China’s Ting Hsin International Group not only dominates China’s RTD market but the international RTD market as well with a 10% global market share, according to a financial report by LD Investments, published by Seeking Alpha. Look for breakouts in RTD and value-added tea products from concentrates and extracts to supplements and cosmetics. These are more likely to be developed in collaboration with Japan (ITO EN) and Taiwan (TenRen, Tingyi and Master Kong) using inexpensive Chinese tea from the mainland. Right now China is primarily developing extracts and “deep-processed” tea for its own domestic market. Globally the demand for black tea is much greater than green. Right now there is a glut of commodity black teas and a shortage of “quality” CTC that is clean, certified and reasonably priced. China loses money producing cheap green and loses volume if they focus only on premium. Conversion to a dominate black tea supplier offers little financial incentives. Ultimately demand for fine green teas will grow due to its health benefits and the adoption of green by foodservice (in US Wendy’s green iced tea at 6,000 stores). Tea exports represents such a tiny fraction of foreign trade that the Chinese government stands to gain very little (other than prestige) from the increase in tea exports. Tea exports earned $1.27 billion which represents about .056% of China’s $2.25 trillion exports. Electronics and other agricultural products generate a lot more money than tea. Unlike the more profitable exports which receive significant government support, much of the investment on outbound marketing will be made by the 200,000 existing tea companies, none of whom are well known brands. Even the largest holds minuscule market share compared to multi nationals like Unilever, Tata Global Beverages or Nestle. Chinese tea culture is fascinating, varied and universally appreciated. China exports tea to 120 countries. The country will more fully develop its impressivle portfolio of prized teas (premium green, oolongs and pu-erh) and that will generate significant income for regional producers willing to undertake mass production. Ultimately these firms will spend the money it takes to promote their offerings in Europe and North America. China’s domestic market currently values low-production, hand-made teas. The global tea market prefers mass-produced teas that are standardized in quality and taste. In time China will show the benefit of its hand-made teas by making them more available in the global market while at the same time collaborate with Western ventures such as Starbucks/Teavana and Unilever/T2 to produce more commercially successful mass-market teas. In sharing its finest teas China gradually transitions from a commodity producer earning $4 per kilo to a quality producer capable of marketing teas at 10-times that rate and with the capacity to supply the entire world’s demand for premium teas. A slowing economy makes it more difficult for Chinese firms to invest the marketing dollars it takes to win share in export markets, but its own domestic demand for cleaner tea will help offset these costs. Learning to market value-added tea domestically is a precursor to global expansion and tolerance for the millions it takes to promote a Lipton or Tetley brand (ie. its latest global ad campaign cost Lipton $40 million, no Chinese company has ever invested that kind of money to promote a tea brand). Another threat is global instability that impacts trade (China territorial expansion, tension with Japan, aggressive behavior by surrogate North Korea) are factors. However, the single greatest threat in my view (and a primary motivation for exports) is the fact that young people in China consider traditional tea “old fashioned” and are not practicing the tea traditions of their parents. Consumer surveys reveal that nearly 70 percent of those born in the 80’s do not like to drink tea. This rises to 95% for those born in the 90’s. Tea is not cool, shops are largely antiquated and there is no marketing beyond basic grocery display. Relatively little good tea is purchased in grocery. Ultimately tea must appeal to a new generation of consumers. As one critic noted: “if all the tea stores look like archaeology dig sites and antique stores, then it won’t attract a lot of customers.” Revenue from a lively domestic market is essential to expansion of exports. Western Tea Festivals launched in the past couple of years are drawing crowds of 5,000 to 7,000. Events in major cities across the globe introduce consumers to tea customs and styles. Educational programs are popular with experts sharing methods of preparation while discussing processing techniques and origin. Retailers typically organize these events in cooperation with local governments and tea marketing associations. Financial support from tea wholesalers, brewing and service ware manufacturers make it possible to keep admission prices low. This event, co-founded by retailers Renee Creer and Corinne Smith, follows the 2014 debut. Organizers expect 7,000 to attend a tea market with 50 stalls, tea education program and to take home $4 souvenir tea tasting cups (for samples). New workshop sessions include tea and dessert pairing with Black Star Pastry and how to create your own chai with the Sticky Chai boys. There’s also the brew lounge where you can kick back and listen to music while sipping a cuppa. Australians spent $384 million on 7.7 billion cups of tea last year. “Tea is trending in Australia at the moment and the success of last year’s festival is a testament to that,” said Smith. Irish Foodservice Suppliers Alliance (IFSA) and the Speciality Coffee Association of Europe (SCAE- Irish branch) are again hosting the three-day Dublin Coffee & Tea Festival. The event in the RDS Industries Hall attracts the industry’s leading Irish tea brands, such as Mrs. Doyles Tea Company, Niks Tea and Solaris along with stands from Lily’s Tea Shop, Bewley’s Coffee and Tea Company and Koyu Matcha Green Tea. 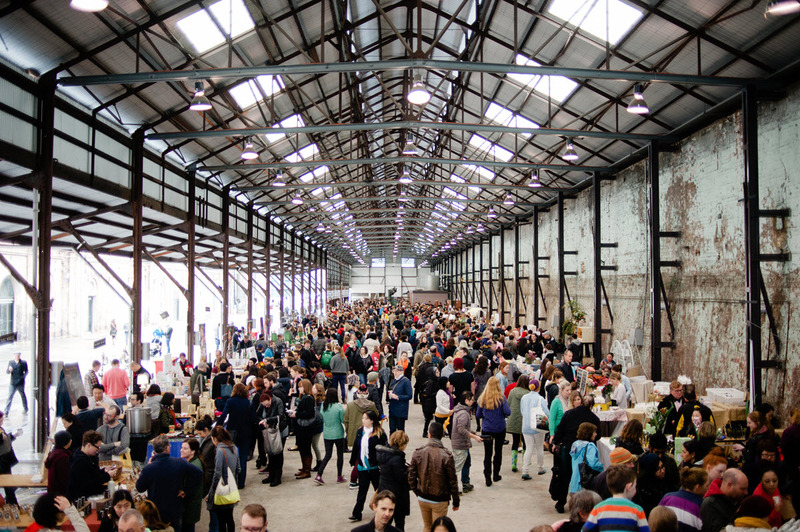 The inaugural event drew 5,700 visitors with 93% indicating they would return in 2015. Dublin is the site of the World Barista Championships in 2016, an event that will bring competitors from 65 countries. With the Irish palate now as sophisticated as our European counterparts, and a vibrant café culture growing all the time, this year’s show features a great mix of exhibitors, education, entertainment and competitions. These include the SCAE Brew School where visitors will be shown how to use different brewing methods; the National Home Barista Championships; and The Food Village for Artisan food and beverage suppliers whose products compliments the coffee and tea drinking experience. And, following on once again from the success of last year’s show, there will be a series of fringe events with all features open to commercial sponsorship opportunities. The Vancouver Tea Society (VTS) is a non-profit that previously hosted a 2013 festival on Vancouver Island. This year the event moves to the Croatian Cultural Centre, East Vancouver. The 2013 event drew 3,500 attendees. VTS hosts bi-monthly tea events including focused tastings and educational sessions. Net proceeds are donated to local charities. “We resolutely believe tea can be a force for tremendous good, and giving back to the city in which we live and work elides perfectly with the social, communitarian ethos that imbues tea culture,” according to VTS, which is managed by a board of five directors active within the local tea industry. Exhibitors include Thay Tea, Tea Sparrow, O5 Tea, Young Mountain Tea, My Matcha Life, Amoda Tea, Trudy Ann’s Chai, ICHIYO’s Matcha Tea Bar and JusTea. Tables are $450. Email del@vancouverteafestival.ca for details. Tea farmers in the United States are eligible to enter the first competition designed to showcase US grown teas. A cash price of $1000 will go the top grower in each of four tea categories, juried by an international panel of judges. Eva Lee, a Hawaii tea farmer and TOTUS awards director, with the Volcano Art Center hosting judging Nov. 4 in Hawaii, thanks to a grant from the Hawaii County Office of Research & Development, cash awards provided by the Hawaii Tea Society, and several contributing agricultural organizations involved in developing the cultivation of tea. The competition will be followed by an exhibition and presentation Nov. 7 at the Volcano Art Center in Hawaii. “I recently returned from Washington DC after talking with representatives on Capitol Hill on the significant development of US grown tea in agriculture and its unique place in family farming,” said Lee, a former head of the Hawaii Tea Society. “The more informed our representatives are on domestic tea production the better assistance they can provide at the county, state and federal level. The TOTUS Awards will raise public awareness and create opportunities for many in tea production nationwide,” she said. The deadline to enter opens Aug. 1, 2015. Entry forms with payment are due Oct. 16. The last day tea entries will be accepted at the Volcano Art Center is Oct. 26. Teas must be 100% grown in the US with no foreign tea blends, scents or herbals added. Categories include white tea, green tea, oolong tea and black tea. The competition is open to both commercial and non-commercial growers. Commercial growers pay $100 per entry. Non-commercial growers pay $40 per entry. Non-commercial growers are those that produce and sell less than 5 pounds of Camellia sinensis per year. Hobbyists and researchers are also invited to submit 36-gram entries. There is a maximum of three entries per tea type. “Now that spring harvests have ended and with summer and autumn yields ahead, competitors should take this time to review, experiment and refine tea entries to demonstrate excellence of your skills,” said Lee. Sponsorships, beginning at $100, are welcome to help underwrite competition expenses, she added. Award-winning tea blogger Tony Gebely was named American Tea Room’s director of technology and distribution channels. He starts Aug. 1. Gebely, a two-time World Tea Award winner for his blog World of Tea (www.WorldofTea.org), has 10 years of experience in digital marketing strategy and business intelligence. He has worked 12 years in the specialty beverage industry and is the founder of Chicago Tea Garden. He will be responsible for all of American Tea Room’s online presence, including management of the website and social media channels, as well as tea education and hospitality outreach. American Tea Room will soon open its second location, a 5,600 sq. ft. space in Los Angeles’ Arts District. The shop features a new open tasting arena and oasis garden tea lounge. The shop, at 909 S. Santa Fe Avenue, will also house corporate offices for the online business which has grown more than 30% year-over-year since launching in 2006. Once the new spot opens, the company plans to remodel its Beverly Hills location into a contemporary, open concept that will accommodate more customers with indoor and outdoor seating, a more comprehensive food menu, and an expanded retail space. This renovation is expected to be completed by late winter 2016. CEO David Barenholtz plans a third location at Fashion Island in Newport Beach. Construction will begin at that location next week he said.